You are responsible for the shipping cost of returned orders. This website, www.victorycoffees.com (“Website”), is the property of Door Bean Coffee LLC (Victory Coffees) a Texas LLC and its use as well as the purchase of goods from Victory Coffees is subject to the terms of this Agreement as found below. victorycoffees.com offers this website, including all information, tools and services available from this site to you, the user, conditioned upon your acceptance of all terms, conditions, policies and notices stated here. By visiting our site and/ or purchasing something from us, you engage in our “Service” and agree to be bound by the following terms and conditions (“Terms of Service”, “Terms”), including those additional terms and conditions and policies referenced herein and/or available by hyperlink. These Terms of Service apply to all users of the site, including without limitation users who are browsers, vendors, customers, merchants, and/ or contributors of content. If you do not agree to all the terms and conditions of this agreement, then you may not access the website or use any services. If these Terms of Service are considered an offer, acceptance is expressly limited to these Terms of Service. Our store is hosted on Cratejoy Inc. They provide us with the online e-commerce platform that allows us to sell our products and services to you. By viewing the site or purchasing from us you are expressly agreeing to these Terms of Service, as well as those of Cratejoy, Inc. Further, you represent that you are at least the age of majority in your state or province of residence, or that you are the age of majority in your state or province of residence and you have given us your consent to allow any of your minor dependents to use this site. You may not use our products for any illegal or unauthorized purpose nor may you, in the use of the Service, violate any laws in your jurisdiction (including but not limited to copyright laws). A breach or violation of any of the Terms will result in an immediate termination of your Services. We are not responsible if information made available on this site is not accurate, complete or current. The material on this site is provided for general information only and should not be relied upon or used as the sole basis for making decisions without consulting primary, more accurate, more complete or timelier sources of information. Any reliance on the material on this site is at your own risk. This site may contain certain historical information. Historical information, necessarily, is not current and is provided for your reference only. We reserve the right to modify the contents of this site at any time, but we have no obligation to update any information on our site. You agree that it is your responsibility to monitor changes to our site. Occasionally there may be information on our site or in the Service that contains typographical errors, inaccuracies or omissions that may relate to product descriptions, pricing, promotions, offers, product shipping charges, transit times and availability. We reserve the right to correct any errors, inaccuracies or omissions, and to change or update information or cancel orders if any information in the Service or on any related website is inaccurate at any time without prior notice (including after you have submitted your order). We undertake no obligation to update, amend or clarify information in the Service or on any related website, including without limitation, pricing information, except as required by law. No specified update or refresh date applied in the Service or on any related website, should be taken to indicate that all information in the Service or on any related website has been modified or updated. We reserve the right to refuse any order you place with us. We may, in our sole discretion, limit or cancel quantities purchased per person, per household or per order. These restrictions may include orders placed by or under the same customer account, the same credit card, and/or orders that use the same billing and/or shipping address. In the event that we make a change to or cancel an order, we may attempt to notify you by contacting the e-mail and/or billing address/phone number provided at the time the order was made. We reserve the right to limit or prohibit orders that, in our sole judgment, appear to be placed by dealers, resellers or distributors. You agree to provide current, complete and accurate purchase and account information for all purchases made at our store. You agree to promptly update your account and other information, including your email address and credit card numbers and expiration dates, so that we can complete your transactions and contact you as needed. All information that you provide in connection with a purchase or transaction or other monetary transaction interaction with this Website or any co-branded website will be accurate, complete, and current. You will pay all charges incurred by users of your credit card, debit card, or other payment method used in connection with a purchase or transaction or other monetary transaction interaction with Victory Coffees or any co-branded website at the prices in effect when such charges are incurred. You will pay any applicable taxes, if any, relating to any such purchases, transactions or other monetary transaction interactions. For more detail, please review our Returns Policy. Certain products or services may be available exclusively online through the website. These products or services may have limited quantities and are subject to return or exchange only according to our Return Policy. We have made every effort to display as accurately as possible the colors and images of our products that appear at the store. We cannot guarantee that your computer monitor's display of any color will be accurate. We reserve the right, but are not obligated, to limit the sales of our products or Services to any person, geographic region or jurisdiction. We may exercise this right on a case-by-case basis. We reserve the right to limit the quantities of any products or services that we offer. All descriptions of products or product pricing are subject to change at anytime without notice, at the sole discretion of us. We reserve the right to discontinue any product at any time. Any offer for any product or service made on this site is void where prohibited. We do not warrant that the quality of any products, services, information, or other material purchased or obtained by you will meet your expectations, or that any errors in the Service will be corrected. Prices for our products are subject to change without notice. We reserve the right at any time to modify or discontinue the Service (or any part or content thereof) without notice at any time. We shall not be liable to you or to any third-party for any modification, price change, suspension or discontinuance of the Service. Victory Coffees® is a registered trademark of Victory Coffees Coffee LLC, its affiliates, subsidiaries or assigns, in the United States and other countries. All rights reserved. Victory Coffees does not lay claim to any third-party mark used on this website or within its products. All rights in the product names, company names, trade names, graphics, logos, page headers, button icons, scripts, product packaging, trade dress and designs of all Victory Coffees products or services, whether or not appearing in large print or with the trademark symbol, belong exclusively to Victory Coffees Coffee LLC, or its respective owners and are protected from reproduction, imitation, dilution, or confusing or misleading uses under national and international trademark and copyright laws. The use or misuse of these trademarks or any materials, except as permitted herein, is expressly prohibited, and nothing stated or implied on this Website confers on you any license or right under any patent or trademark of Victory Coffees Coffee LLC, or any third party. All copyright rights in the text, images, photographs, graphics, user interface, and other content provided on this Website, and the selection, coordination, and arrangement of such content, are owned by Victory Coffees or its third-party licensors to the full extent provided under the United States Copyright Act and all international copyright laws. Under applicable copyright laws, you are prohibited from copying, reproducing, modifying, distributing, displaying, performing, or transmitting any of the contents of this Website for any purposes. Nothing stated or implied on this Website confers on you any license or right under any copyright of Victory Coffees or any third party. This Website and the information contained in reference herein are for your personal, non-commercial use only. Except as otherwise specifically permitted herein, you shall not broadcast, duplicate, copy, reproduce, edit, manipulate, modify, publish, rent, sell, publicly display, perform, distribute, transmit, or circulate to anyone the contents of this Website, or use the contents of this Website in litigation, or for any commercial or promotional purposes, without the express written consent of Victory Coffees Coffee LLC, or its lawful successors and assigns. For usage permission, contact us. Victory Coffees grants you a limited license to access and make personal use of this Site and not to download (other than page caching) or modify it, or any portion of it, except with express written consent of Victory Coffees. This license does not include any resale or commercial use of this Site or its contents; any collection and use of any product listings, descriptions, or prices; any derivative use of this Site or its contents; any downloading or copying of account information for the benefit of another merchant; or any use of data mining, robots, spiders or similar data gathering and extraction tools. Neither this Site nor any portion of this Site may be reproduced, duplicated, copied, sold, resold, visited, or otherwise exploited for any commercial purpose without express written consent of Victory Coffees. You may not frame or use framing techniques to enclose any trademark, logo, or other proprietary information (including images, text, page layout, or form) of Victory Coffees and our affiliates without express written consent. You may not use meta tags or any other hidden text using Victory Coffees's name or trademarks without the express written consent of Victory Coffees. Any unauthorized use terminates the permission or license granted by Victory Coffees. You are granted a limited, revocable, and nonexclusive right to create a hyperlink to any page of Victory Coffees so long as the link does not portray Victory Coffees or its products or services in a false, misleading, derogatory, or otherwise offensive manner. You may not use any Victory Coffees logo or other proprietary graphic or trademark as part of the link without express written permission. This Site may contain hyperlinks ("links") to Web Sites operated by persons or entities other than Victory Coffees ("third-party Web Sites") or to co-branded Web Sites operated by a third party, including affiliates ("co-branded Web Sites"). We provide such links for your reference and convenience only. A link from Victory Coffees to a third-party Web Site does not imply or mean that we endorse the content on that third-party or co-branded Web Site or the operator or operations of that Web Site. You are solely responsible for determining the extent to which you use any content at any third party or co-branded Web Sites to which you might link from our Site. Victory Coffees IS NOT RESPONSIBLE OR LIABLE FOR ANY LOSS OR DAMAGES INCURRED AS A RESULT OF ANY DEALINGS WITH ANY THIRD-PARTY WEB SITE/PRODUCTS OR CO-BRANDED WEB SITE OR PRODUCT, ANY MERCHANT OR OPERATOR OF A THIRD-PARTY WEB SITE OR CO-BRANDED WEB SITE, OR ANY OTHER PERSON WITH WHOM YOU ENGAGE IN ANY TRANSACTION. All products purchased from this Website are transported and delivered to you by an independent carrier not affiliated with, or controlled by, Victory Coffees. Title to products purchased on this Website, as well as the risk of loss for such products, passes to you when Victory Coffees delivers these items to the carrier. Victory Coffees attempts to be as accurate as possible in describing its products. We do not warrant that product descriptions or other content of this Website are accurate, complete, reliable, current, or error-free. 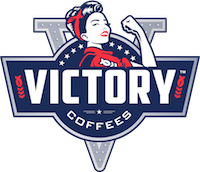 Some Victory Coffees products displayed on this Website are available in select retail stores in the United States and select foreign markets while supplies last. In some cases, merchandise displayed for sale on this Website may not be available in retail stores. Victory Coffees has made every effort to display as accurately as possible the colors of our products that appear on this Website. As the actual colors you see depend on your computer monitor, however, we cannot guarantee that your monitor's display of any color will be accurate. We do not guarantee, represent or warrant that your use of our service, website or products will be uninterrupted, timely, secure or error-free. We do not warrant that the results that may be obtained from the use of the service will be accurate or reliable. You agree that from time to time we may remove the service for indefinite periods of time or cancel the service at any time, without notice to you. You expressly agree that your use of, or inability to use, the service is at your sole risk. The service and all products and services delivered to you through the service are (except as expressly stated by us) provided 'as is' and 'as available' for your use, without any representation, warranties or conditions of any kind, either express or implied, including all implied warranties or conditions of merchantability, merchantable quality, fitness for a particular purpose, durability, title, and non-infringement. You, the Buyer, agree to defend, indemnify, and hold harmless Victory Coffees Coffee LLC, and its affiliates, successors and assigns, and its and their directors, officers, employees, agents, co-branders or other partners from and against any and all allegations, claims, demands, actions, causes of action, proceedings (whether threatened or pending), orders, damages, losses, liabilities, costs and expenses, including reasonable attorney's fees and other legal expenses, and judgments of any kind of nature, incurred by Victory Coffees Coffee LLC, arising out of or relating to your use of the Website, the purchase and use of our Products, the use of any Third-Party Products found within our Products as well as any violation of this Agreement, or your violation of any rights of another in connection with this Agreement. In no case shall DOORBEAN.com, our directors, officers, employees, affiliates, agents, contractors, interns, suppliers, service providers or licensors be liable for any injury, loss, claim, or any direct, indirect, incidental, punitive, special, or consequential damages of any kind, including, without limitation lost profits, lost revenue, lost savings, loss of data, replacement costs, or any similar damages, whether based in contract, tort (including negligence), strict liability or otherwise, arising from your use of any of the services or any products procured using the service, or for any other claim related in any way to your use of the service or any product, including, but not limited to, any errors or omissions in any content, or any loss or damage of any kind incurred as a result of the use of the service or any content (or product) posted, transmitted, or otherwise made available via the service, even if advised of their possibility. Because some states or jurisdictions do not allow the exclusion or the limitation of liability for consequential or incidental damages, in such states or jurisdictions, our liability shall be limited to the maximum extent permitted by law. BUYER ASSUMES ALL RISK OF USE FOR THIS PRODUCT. You agree that no joint venture, partnership, employment, instructor, instructee or agency relationship exists between you and Victory Coffees as a result of this Agreement or your use of this Website. Nothing contained in this Agreement is in derogation of Victory Coffees's right to comply with governmental, court, and law enforcement requests or requirements relating to your use of this Website or information provided to or gathered by Victory Coffees with respect to such use. A printed version of this Agreement and of any notice given in electronic form shall be admissible in judicial or administrative proceedings based upon or relating to this Agreement to the same extent and subject to the same conditions as other business documents and records originally generated and maintained in printed form. The failure of Victory Coffees to enforce any provisions of this Agreement or respond to a breach by you or other parties shall not in any way waive its right to enforce subsequently any terms or conditions of this Agreement or to act with respect to similar breaches. The terms of this agreement shall not be construed against the drafter of the agreement. In the event of any dispute arising under this Agreement or as result of the use of Victory Coffees Coffee LLC, products this Agreement shall not be interpreted for or against any party hereto on the ground that such party drafted or caused to be drafted this Agreement or any part hereof. This Agreement is the entire and final Agreement between Victory Coffees and the purchaser regarding the purchase of our Products as well as our Website and its content, and supersedes any prior or contemporaneous communications between Victory Coffees and you regarding our Website and its contents.